I know I've said it before, but it needs to be said again: What Michael Phelps is doing in Beijing is the most unbelievable athletic accomplishment we've seen this year. Six gold medal performances and six world records broken in each of those efforts. Not since Barry Bonds was slamming 80 homers a season was I this impressed by the breaking of historic records, err bad example. In a calender sports year that has included possibly the greatest tennis match of all time, Federer v. Nadal at Wimbledon, possibly the greatest golf tournament of all time, Tiger on one leg at the U.S. Open, and the greatest upset in Super Bowl history, Giants over the 18-0 Patriots, a 24-year old Olympic Swimmer from Baltimore is trumping everyone. SI Sportsman of the Year, ESPY Male Athlete of the Year, and maybe even Time Magazine Person of the Year. 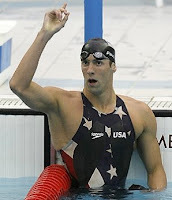 KEEP IT REAL, Michael Phelps is an Olympic GOD. At what point do the Texas Rangers realize, to win at the highest level of baseball, its all about pitching. No team fails to grasp that concept quite like the Texas Rangers. From the historic signing of Alex Rodriguez back in 2001 to the construction of their current roster, the Rangers have never developed nor signed quality front line starting pitching. The Rangers divisional opponents, The Seattle Mariners trade for Eric Bedard and develop Felix Hernandez, the Anaheim Angels acquire Jon Garland and develop Ervin Santana, Francisco Rodriguez, and John Lackey, the Oakland A's have developed AND traded big league pitchers Barry Zito, Rich Harden, Danny Haren, Tim Hudson, and Mark Mulder. The Rangers? The biggest pitching moves they've made in the past ten years was signing a washed up Eric Gagne in 2007 (granted they got a kings ransom for him at the deadline from the Red Sox) and acquiring the likes of Chan Ho Park in 2002 for three seasons. After scoring 17 runs against the Red Sox on Tuesday night and LOSING, the Rangers followed that up by giving up another 8 runs on Wednesday, and finally 10 runs on Thursday. All-Star Rangers, Ian Kinsler, Michael Young, Milton Bradley, and Josh Hamilton drive in enough runs to win against the Royals and Mariners, but to beat teams like Anaheim and Boston, aces are what you need. GET A PITCHER and KEEP IT REAL! The death of an NFL team, the quarterback controversy. The most important position in major professional team sports is the quarterback of a football team. A controversy surrounding that position is the single reason why "quarterback competitions" in training camp, are the death of an NFL teams season. The Colts, Cowboys, Patriots, Chargers, Steelers, and Jaguars are the only teams I consider to be ACTUAL CONTENDERS for a Super Bowl trophy. The common thread? None of those teams are in the midst of quarterback competitions. The Ravens, Cardinals, and Dolphins, all haven't fully bought into who is under center, and of course all of those teams will pick in the Top 10 in 2009 and miss the playoffs. I don't know what these teams are pondering, Troy Smith should be the starter in Baltimore, Matt Leinart should be the starter in Arizona, Kurt Warner should be back stocking shelves, and who cares who starts for the Dolphins, they passed on Matt Ryan. Newsflash to NFL teams everywhere, pick your starter and stay with him, just KEEPING IT REAL. A little less of KEEP IT REAL FRIDAY, but next week were coming strong: NFL PREVIEW, OLYMPICS WRAP-UP, and the fall of the Tampa Bay Rays. KEEP IT REAL! Say It Ain't So . .
Steve Smith, Paul Pierce, and Ocho Cinco!